CUSAT CAT 2018 is an entrance exam for admission to Cochin University of Science and Technology (CUSAT). It is a computer-based exam which will be conducted on 28 and 29 April 2018. CUSAT CAT provides admission to eligible candidates in various undergraduate & postgraduate programmes (other than MPhil & MTech) on the basis of CAT Rank. The application process will start on 7 February 2018. Integrated Courses- BBA /B. Com LLB Hons, M.Sc Photonics. Latest Update: CUSAT CAT Result is declared on 3 May 2018. 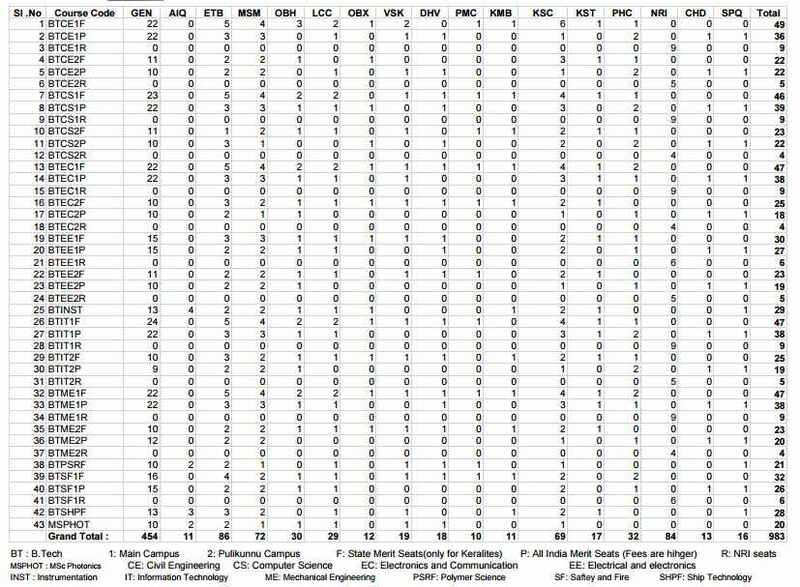 Check CUSAT CAT 2018 Result Here. Candidates are informed that the last date of CUSAT CAT 2018 application submission is extended from 3 March to 8 March 2018. Candidates can click on the following link to fill the CUSAT CAT 2018 Application Form. Who is classified as a Keralite for the purpose of appearing in CAT? Children of AIS (All India Services) officers (Non-Keralites) allotted to Kerala Circle are deemed to be Keralites. Students from outside Kerala are eligible to appear in CUSAT CAT 2018 and can opt for All India Quota Seats (AIQ) or All India Merit Seats. Candidates applying for CUSAT CAT 2018 are required to submit their CUSAT CAT 2018 application form online by visiting the official CUSAT website. The candidates willing to appear in CUSAT CAT 2018 can pay the application fee from both online and offline mode. The application fee and the course fee is mentioned in following tables. Online: Candidates can pay for CUSAT CAT 2018 Application form online via internet banking at SBI or SBT only. Offline: They can also make payment via bank e-challan which is to be paid in cash at State Bank of India or State Bank of Travancore. Mechanical Engg., Safety & Fire Engg. Lateral Entry to B.Tech. For Instrumentation Engg. Children of Gulf Workers: The tuition fee shall be US$3000 per year, payable at the beginning of the academic year. The students need to score Minimum of ten marks in Mathematics, Physics, and Chemistry in CUSAT CAT 2018 to be eligible to figure in the respective rank list. The minimum marks requirement is not applicable to candidates under SC/ST. CUSAT CAT Marking and Scoring: The CAT score will be calculated as per the formula, S = 3R - 1W, where S is the CAT score, R is the number of right answers and W is the number of wrong answers. Relaxation in Marks: SEBC (Socially & Economically Backward): Marks relaxation by 5% in all courses except in B.Tech in Marine Engineering. No relaxation in marks for SC/ST candidates. Through the Indian Council for Cultural Relations (ICCR) attached to the Ministry of External Affairs, Govt. of India. 09.30 a.m. - 12.30 p.m. The entrance test CUSAT CAT and LET will be conducted in all India basis in the given below test centres. 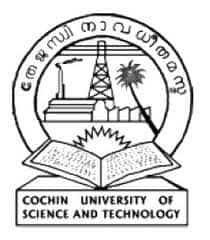 The Cochin University of Science and Technology will start the mock test for the candidates. The CUSAT exam mock test will be available on the official website of CUSAT and the candidates can refer to the website with the help of the link given below. The candidates are suggested to read all the instructions and guidelines before taking the test. Every candidate who is preparing to appear in the CUSAT 2018 exam should take the mock test as it helps a lot to improve you. Mock tests state the students that which topics they have already learned and what else are yet to prepare.